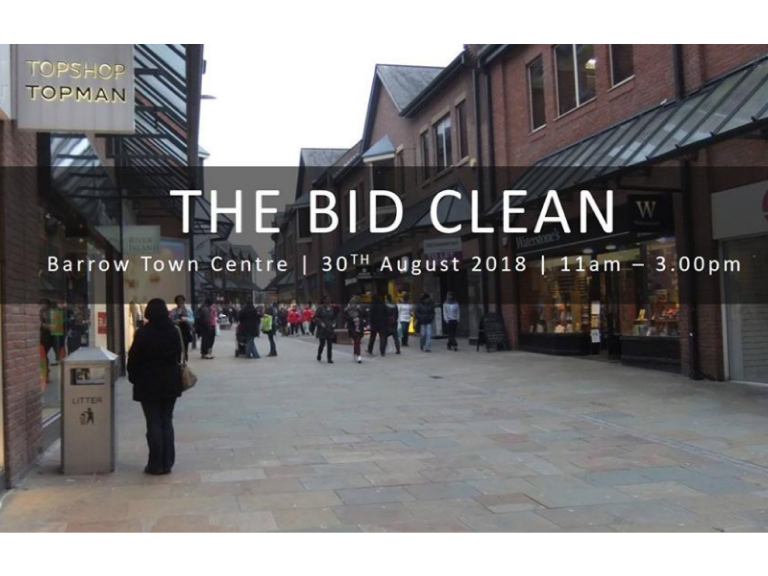 The BID Clean event is an opportunity for shop owners, staff and local residents to work together to make Barrow Town Centre clean and is a chance for us all to show that we have pride in our own town and ensure that the town centre is clean and tidy for the Tour of Britain coming on September 7th. If shop owners, managers and staff would like to get together and clean their own street, the BID are happy to help and can provide additional volunteers and equipment. Whatever time and energy you can spare to make this event a success is very welcome. If you can volunteer for the entire period – fantastic; or maybe you can pop along and do an hour or two, either way, you’ll be making a big difference. So please join our Mayor and BID Team to make Barrow town centre clean. You can get involved and volunteer by emailing: manager@barrowbid.co.uk using the subject line: BID Clean volunteer. Equipment and refreshments will be provided to all volunteers. The event is a Barrow BID initiative in partnership with Barrow Council’s Street Care Team and supported by the The Best of Barrow and Furness and The Well.